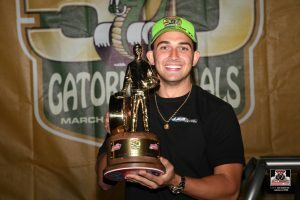 The 50th annual NHRA Gator Nationals for the fans was a big success. For the Sportsman it was a mixed bag, and for some racers it was a disappointment. Class at the Baby Gator was held a week before the nationals and went well. For the most part all the racers were very happy, and the weather cooperated. When it came to the nationals, well lets say the schedule was not meet with approval. We were told because of the amount of classes, NHRA had no choice. 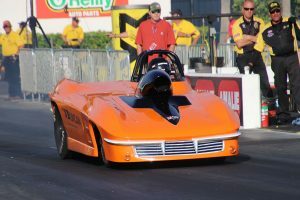 The schedule was 2 qualifiers for Stock and Super Stock, Top Dragster and Top Sportsman, and two time shots for the Super Classes along with round 1 of eliminations, all on Thursday. And although there were more classes, the car count was about the same leaving some to wonder why the schedule change. 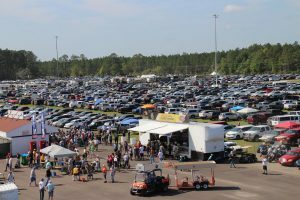 With all that, NHRA made a very positive and popular move to run the Sportsman eliminations to its completion on Saturday because of the pending weather, many agreed it was a good call. 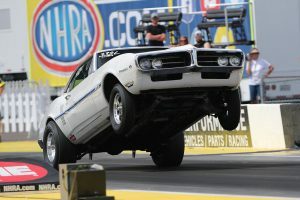 The NHRA staff had to go on over time, and the racers were very appreciative for good and safe track. 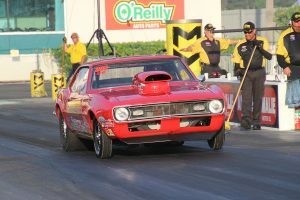 Saturday night finals was a first, but it turned out well for the 8 Sportsman winners that ran that day and night. Drew Skillman, new to the very popular and fast growing Factory Stock Showdown class was the number 5 qualifier, but arguably had the car to beat. 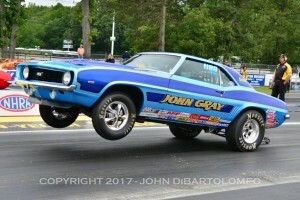 In the third round Skillman ran the quickest pass in the history of the Factory Stock Showdown, 7.718. 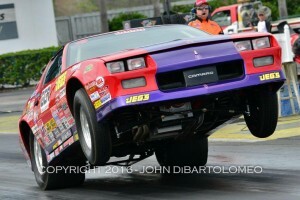 Skillman was impressive, averaging a 7.736 in four rounds of competition. 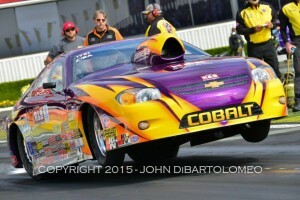 Bell was the defending champ from last years Gator Nationals, but could not hold of the power of Skillman’s Cobra Jet. 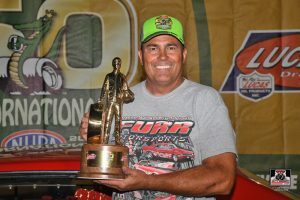 Skillman ran a 7.736 to Bells 7.887 to get his first Factory Stock Show win and 16th overall NHRA national win. Graig Bourgeois has been in 12 finals, but this one was going to be hard fought. Daniels had the performance advantage qualifying number 3. Bourgeois had to take out David Rampy in the quarters to earn a bye into the finals. He did, but it cost him some CIC. Fortunately Dainiels also got a CIC correction in the semi’s. Even with the CIC penalty Daniels still had the performance advantage. 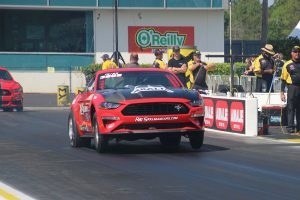 Bourgeois was triple zip in the final, Daniels could not overcome the starting line advantage. 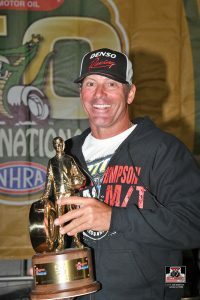 Bourgeois gets his 9th national NHRA event win. Kevin Riner is the defending champ at the Gator’s. Both driver have similar lights, and it will come down to who drives the stripe the best. Alvey pedals at the stripe and looks to take the finish line, but breaks out by .005. Riner also pedals the stripe but lets Alvey take the stripe and only breaks out by .002. Three thousands decides this win along with some good driving. 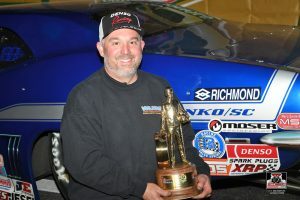 Riner gets his 2nd NHRA national event win. Stock: Randi Lyn Ship over Eddie Longhangy Jr.
Another double breakout win would decide this final. Randi Lyn Shipp was a little late, but Longhangy was later and ran it out the back to breakout by .027. 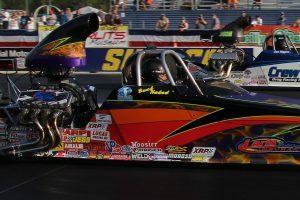 Shipp pedal the finish line breaking out by only .003 giving her a 6th NHRA national event win, Shipp has been in 10 fianls. Laris in on time, but Stephenson is a little late. Both drivers keep it to the wood at the stripe. Stephenson runs closer to the 8.90 index, but looses to much at the tree giving her no room to get in on. 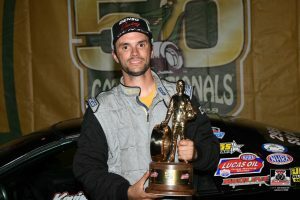 Laris picks up his 3rd NHRA national event win. Both driver are good on the tree, it comes down to driving the stripe. Richardson takes care of business and lets Watts take the stripe and breakout by .029 to Richardson’s .002. 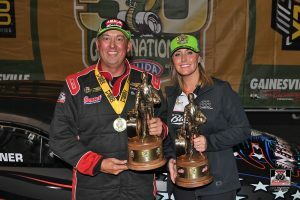 Richardson now has 3 NHRA national event wins to his credit. 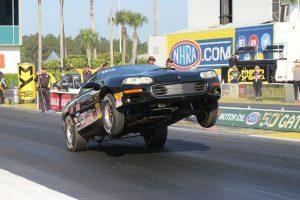 Super Street has never been held at the Gatornationals. Its big race to win because it may never be run again here. 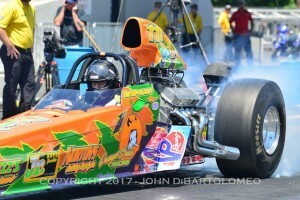 Doug Ramsey hammer’s the tree with a .005 and is .005 over. Fuller’s .033 light and .027 over is no match for Ramsey’s 10 pack. 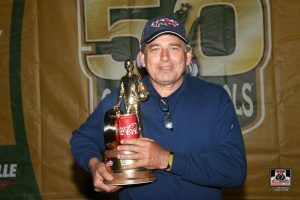 Ramsey gets his first win, and its a big one at the 50th Gatornationals. Both drivers were on their game the whole race, but it came to and end early on a .005 red light from Furr. 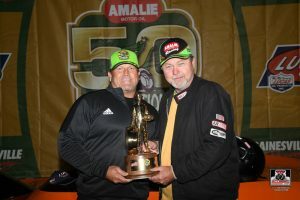 Bertozzi takes the easy cruise down the 1320 to pick up his 22nd NHRA national event win. Wilkins driving is spot on this race, running dead on with 5 and a .020 light is tough to beat in a final Top Sportsman race. Thrift is unusually late with a .290 and has no chance of picking up the win at the 50th. 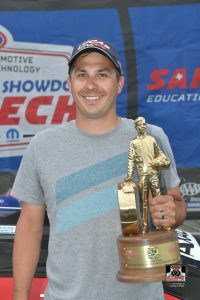 Wilkins almost cuts it to close with the .005 over, but gets the job done to take home his 3rd NHRA national event win.